Jones are proud to bring you our newest fabric collection, Shalimar. This range has everything you need to bring that springtime feeling to your home. This collection brings together contemporary styles and patterns with this seasons must have colours, from pastel blues and reds, neutral greys to rich indigo and gold. 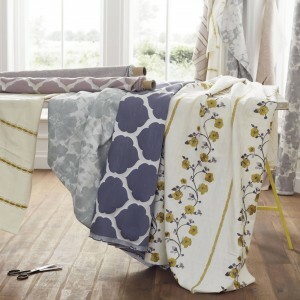 This collection is available across 6 different ranges, all with their own unique styles; Bergamot, Saffron and Sorrell embrace delicate floral patterns, while Persia, Lahore and Shalimar Stripe reflect bold and contemporary styles. Pastels are always a key feature for the spring and summer months, and a great opportunity to fade out the darker colours and bring in the light. Each and every colour in the range has a pastel shade, and will blend in to any room, no matter what the colour scheme. The yellow and grey colours that run through this range reflect the latest trends seen across the stores and trade shows, the blend of the colours together gives you the opportunity to breathe some life in to muted and neutral tones, the perfect way to prepare for the upcoming summer months. 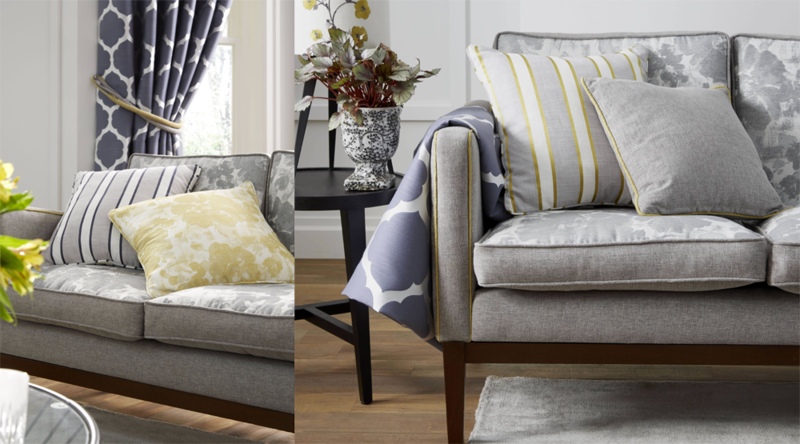 Patterns are a key feature in this range, with the decorative florals of the Saffron and Beramot range and bold stripes of the Shalimar Stripe range, it works perfectly in any form and will enhance any room, whether it’s a pair of curtains, or the cushions on a sofa, it projects style and sophistication. Patterns are a perfect way to make a statement in any space; they can add detail in to a plain décor and add texture to a smooth surface.